We've been waiting for a phone from Apple for several years — there had regularly appeared rumours, spy photos, incredible concepts, and allegedly insider data. Some people had been repeating all these years that it's about to appear, the others had been more careful in their forecasts. There had also been skeptic people — but very few. It's only natural — having conquered the market of mp3 players, the next logical step is to enter the market of mobile phones. It's a huge market that opens wide prospects. Apple was silent, as always. It had been silently working on iPhone for two years and a half. Steve Jobs, Apple's CEO, unveiled the mystery and was dwelling on features of the new product for an hour and a half on January 9, at the opening of MacWorld Expo. Besides, he spoke a little about Apple's success, Apple TV, and new movies in iTunes Store from Paramount — that's a topic for a separate article. Before proceeding to the examination of iPhone, let's list the strong points of Apple. First of all, the company offers excellent design and usability. While it's all more or less clear about the former, the latter is being catastrophically underestimated by most manufacturers of various equipment — from mp3 players to computers. A simple example — iPod. When the first iPod appeared on the market, there existed lots of mp3 players with good functionality and technical characteristics. They offered built-in voice recorders, FM radio, and library management functions... And there suddenly appears the plain iPod without such functions, and it conquers the market. Steve Jobs is absolutely right - if you look at the existing smart phones, you understand that they are too complex to use. Even usual phones are so complex that many users rarely use such a simple application as an address book, they prefer to select a contact in the recent calls list. To say nothing of e-mail, web browser, and other features — they are mostly used by technical savvies who love new technologies and gadgets rather than natural, frequently used functions. Besides, the head of the company severely criticized styluses, which should be secured somewhere, and which always get lost, inconvenient keypads and soft keys, which are always available irregardless whether you need them or not at the moment, as well as infantile software — it's not convenient even to browse web sites. iPhone incorporates three cherished dreams of Apple fans — a wide iPod to watch movies, a mobile phone, and a PDA. 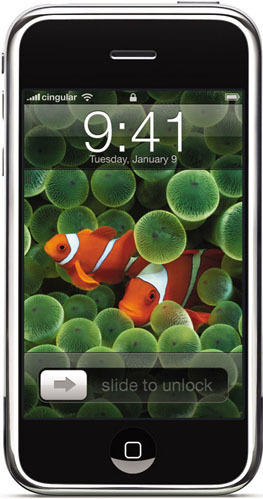 Like most Apple products, iPhone has an attractive and minimalist design. The front panel is black. Edges, sides, and rear panel are metallic. The front panel houses a large 3.5" display with a speaker above and a single button under it. That's all what concerns visible elements. The rear panel contains only a 2 Mp camera in the upper corner. Before we analyze phone features, let's examine technologies used in iPhone. All in all, the phone uses more than 200 patents. Apple intends to protect them actively. 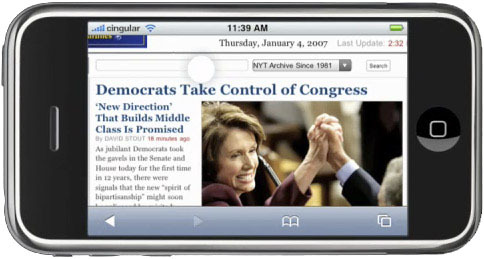 iPhone is equipped with a multi-touch display, i.e. it can be touched in several places simultaneously. For example, if you want to resize a photo, web site, map, and so forth, you just put two fingers on the display and then draw them closer or farther away. According to Apple, iPhone uses revolutionary technologies to provide high precision of presses. Besides, when you type on a virtual keyboard, all mistypes are corrected automatically. It may happen rather often, because your finger covers several virtual keys at once (it's not as thin as a stylus). This phone (smart phone, communicator, wide iPod, PDA?) works under Mac OS X. We have no information about its version and how many features are cut down. 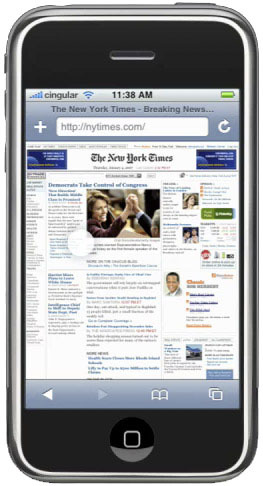 iPhone offers a multitasking environment. For example, you can browse a web site and get your e-mail on the background. However, there is nothing sensational about it. Wireless features of the new product are up to the mark: along with four cellular standards (GSM 850, 900, 1800, 1900), iPhone offers Bluetooth 2.0 EDR, Wi-Fi, and EDGE. So there shouldn't be any problems with accessing Internet via a mobile operator or the nearest access point. Bluetooth and Wi-Fi let us hope for wireless synchronization with a computer. 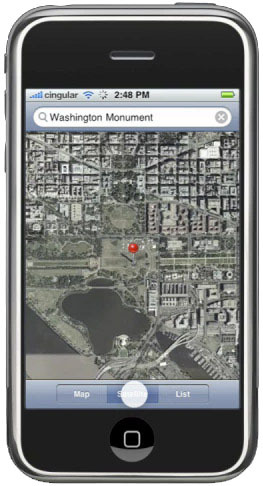 iPhone is equipped with three sensors: an accelerometer, a distance sensor, and a light sensor. The first sensor determines how you hold your iPhone — horizontally or vertically. It then rotates the contents of the display (for example, it can rotate a photo; when you navigate through your music library, it changes the album selection interface — Cover Flow is used for landscape orientation, like in iTunes 7). The distance sensor is placed near the speaker. When you put the phone to your ear, backlight is turned off and the touch screen stops reacting to presses (for example, you won't press the cancel button with your cheek). Besides, it allows to save the battery. And the light sensor adjusts a backlight level, to make it optimal for current light conditions. So, after you turn the phone on (the button on top), you should unlock the phone by moving the virtual slider from left to right. The phone then shows the main menu (to open it from any application, you should press the only real button on the front panel). The status line is on top, like in most phones and smart phones. It contains information about the network signal level, your operator, Wi-Fi status, time, and battery charge (it may provide even more information — we don't have detailed information about it yet). The remaining part of the screen is occupied by application icons. They are large enough not to miss them with your finger. For the moment, they are: sms, calendar, photos, camera, calculator, shares, maps, weather, notes, clock, and settings. 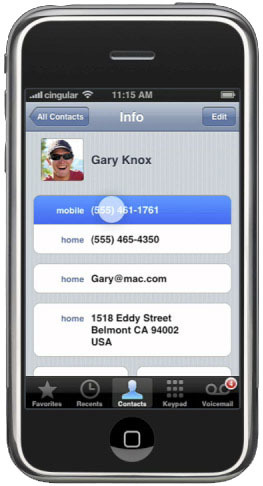 There is a menu with four sections below: Phone, Mail, Web, and iPod. Let's start with the last one. 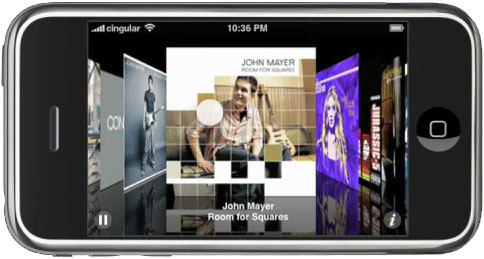 As a player, iPhone offers audio and video playback. iTunes is traditionally used for synchronization. The player offers thought-out navigation. 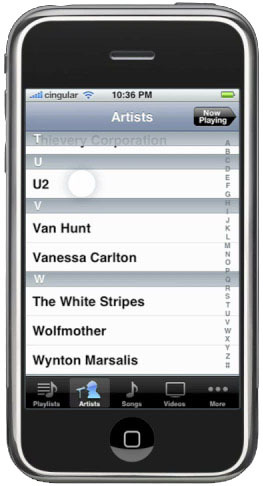 For example, when you choose iPod in the main menu, the phone shows a list of all files. You can choose a navigation mode below: playlists, artists, songs, video, and more... (we don't know what it means yet.) Cover Flow is enabled in horizontal orientation, and you can conveniently select an album. To move through the list, you just have to scroll it with your finger — it's programmed to have some force of inertia to scroll on its own for some time after it, a nice-looking intuitive solution (no scroll bars). Naturally, playback is paused when you receive a call. iPhone offers traditional phone functions. There is practically nothing revolutionary about them, except for a very convenient user interface - choosing a contact in the address book, conference calls, all these functions are easy to use. Perhaps, it really gives modern technologies a chance to be used everywhere. 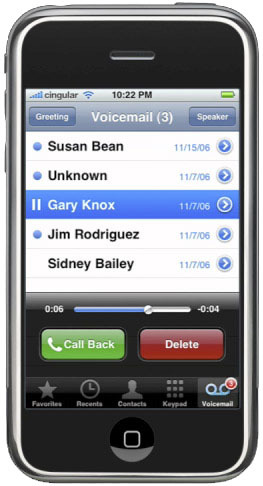 What concerns unusual functions, we can tell you about voice mail. 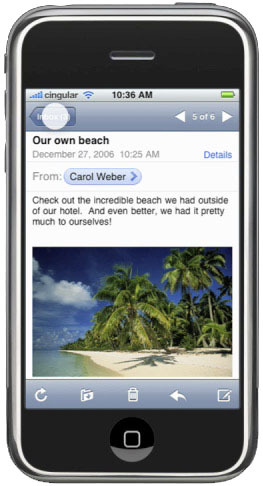 In cooperation with the largest mobile operator in the USA, Cingular, Apple allows to select messages to play. 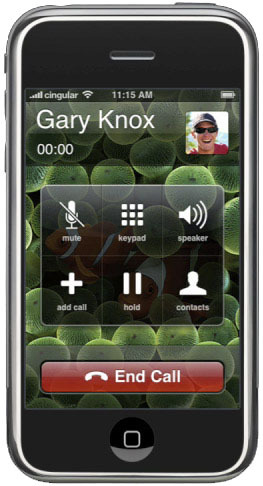 That is the phone menu shows a list of people that left voice messages and you can listen to each of them separately. You can manage them via the phone without using the voice interface. But this function must be supported by your operator, so its chances to appear in Russia even after official shipments of iPhone are very low. 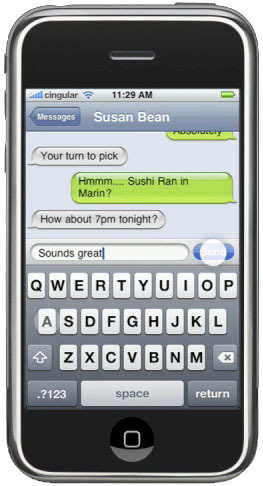 Sms messages are managed in the form of iChat dialogs — when you send a message, you see all previous messages exchanged by you and this person. Nothing extraordinary again, but easy and convenient — remember how often (if you often use sms) you had to navigate through menus to recall previous messages. 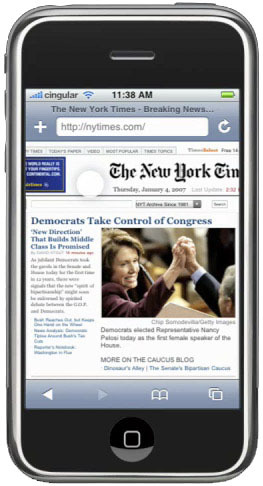 Internet features of iPhone include Safari browser (that's where Mac OS X potential is fully revealed; browser engine in particular), Mail, Google maps, and widgets. Judging by the demos, all these components are very well implemented. For example, if you have ever used a browser in a smart phone, you know well that it's not an easy task: wrong code analysis, very small browser window, large scroll bars at the sides. This browser offers maximum workspace. You see a whole web page at first, and then if you want to read some text, you just press it and this fragment is zoomed to readable size — an excellent solution. 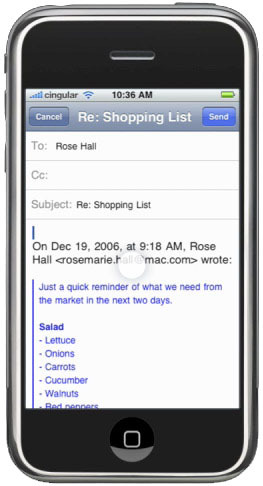 The e-mail client supports POP3 and IMAP. It's all clear: integration with the address book, you can e-mail files from the context menu. We should mention maps. Eric Shmidt, executive director of Google, entered the board of Apple's directors for a reason (we had noted in our 2006 Digest that we saw no significant fruit of cooperation between these two companies — and voila). 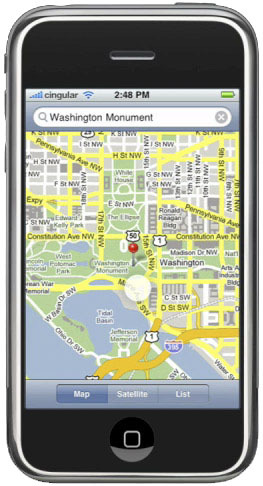 iPhone is fully supported by the super popular service Google Maps. 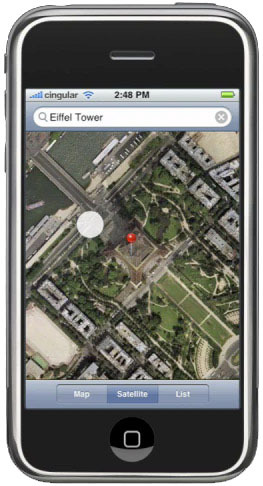 You can search objects on the map, browse usual and satellite maps of the world — a very useful feature. Probably the only disappointment is the lack of GPS: GPS would have supplemented maps well. But in this case, Apple would either have to load offline maps, or your map position would have been available only in case of Internet connection (EDGE, Wi-Fi) - it makes the idea a little less useful. 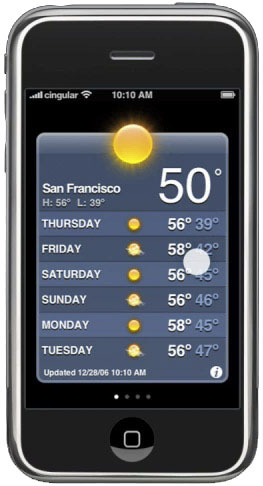 iPhone supports widgets — small applications with useful information. Mac OS X 10.4 Tiger stores widgets in Dashboard. Microsoft Vista calls them differently - gadgets. The phone has the following widgets - calculator (it's probably implemented as a stand-alone application), stocks, weather, notes (and again, it may be a stand-alone application — we don't have enough information), clock. We know nothing about the built-in camera, except that it's in the top left corner on the rear panel and that it's a 2 Mp camera. According to David Pogue, it works well, but the viewfinder (display) may show the picture with some delay. But Steve Jobs tells him that this drawback will be fixed by the time iPhone is launched. Perhaps, that was the reason it was not demonstrated at the conference. 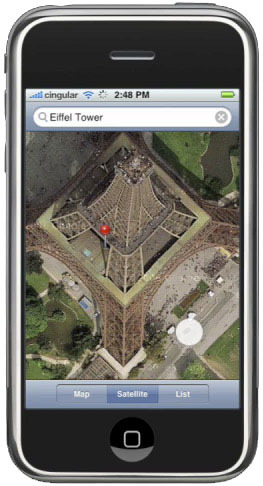 So, let's face the facts, what is iPhone from the technical point of view (although we have scarce information). Battery life: up to 5 hours of calls, video playback, and Internet browsing and up to 16 hours in audio playback mode. Battery life in idle mode is unknown. iPhone launch dates are disappointing. The new product will appear in the USA only in June (!). 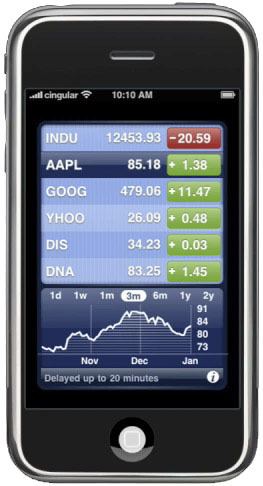 What concerns Europe, Apple promises iPhone by the end of 2007, in Asia — 2008. The price of iPhone with 4 GB of flash memory will be $499, with 8 GB — $599. Why did Apple present iPhone so long before its launch date? Six months prior to its sales in the USA! One of the reasons may be the desire to keep users in suspense, to make them look forward to the long-awaited product, and to raise spirits of investors and analysts with regard to company prospects. But then the question is why the company does not do it with other products: for example, iPods are almost always presented on the day their sales start. We can mention the following recent announcements - iTV (or Apple TV) — a TV box, connected to a computer via Wi-Fi, which allows to watch movies, listen to music, and browse photos on a large TV-set, and not only on the monitor. But this behavior can be explained here: iTV was announced right when iTunes Store started to sell movies and there appeared a choice — to buy usual DVD or to order movies via iTunes. So iTV was intended to calm users down and to bring them over to the second option. That is to persuade them that buying movies now you can watch them on a computer, iPod, and on a home theater (soon), so there are no reasons to buy usual DVDs. But what's up with iPhone? Why was it announced ahead of time? Nothing to show at MacWorld Expo? I doubt it. First of all, the company could show iTV. Secondly, they could have announced new features of Mac OS 10.5 Leopard. Besides, iWork '07 with iLife '07 should be round the corner — they contain the year number in their titles for a reason. So there must be another reason. Just to make people save money right now? I don't think so. Firstly, because it's too long to wait for the new product. Secondly, benefits from people, who won't buy the new product only because they have recently bought a phone already, will hardly make the company change its policy. So there must be another reason. It most likely makes no sense to hide details about the new mobile phone because of Federal Communications Commission (FCC), which should approve the launch of this model (by the way, it takes several months). Since the time of application, the documents may appear in open sources and Apple just doesn't want other people to present iPhone (Apple is good at presenting devices). There an interesting situation with with rights for the iPhone trademark. The fact is that Cisco got rights for the iPhone trademark in 2000, having bought Infogear, which had registered this trademark and sold iPhone products for a number of years. Infogear officially registered this trademark on March 20, 1996. Linksys, working as part of Cisco, has been manufacturing a new family of iPhone products since the beginning of last year. 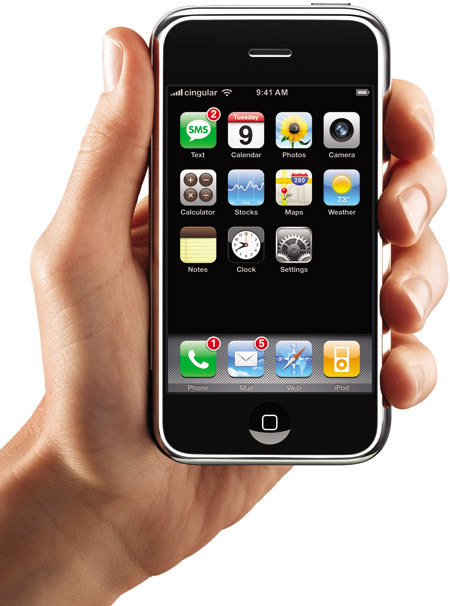 On December 18, 2006, it expanded the iPhone product line by adding several new products. Steve Jobs did not touch upon the topic of product names and trademarks. Right after the conference Cisco announced that it was conducting negotiations with Apple on this issue, the agreement could be signed in the nearest hours, at least Cisco counted on settling all the issues by the end of the day. The conflict seemed to be over. Nothing of the sort. It became known in the evening of January 10 that Cisco sued Apple for the violation of its trademark. Here (PDF, Eng.) you can read the moving papers. The outcome of this conflict is still not clear. In conclusion we'd like to cite Palm's executive director, Ed Colligan, speaking about iPhone just several months ago, on November 21, 2006: "We've learned and struggled for a few years here figuring out how to make a decent phone. PC guys are not going to just figure this out. They're not going to just walk in." What can we say? After the presentation, Palm stocks has dropped by 5%, Apple stocks have risen by 10%. 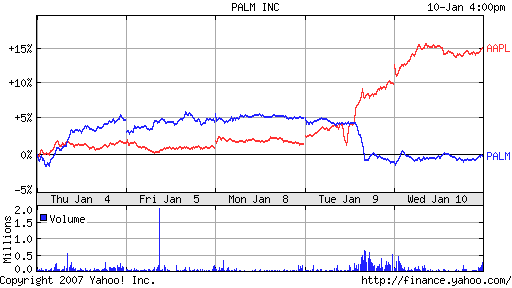 BusinessWeek informed that Palm founder, Jeffrey Hawkins, sold 22000 of its shares. Welcome to 2007.